The Sunday Salon: UCF Book Festival – my books. my life. Yesterday, Ben and I headed over to Orlando for the UCF Book Festival. Last year got there, saw Billy Collins, and went home. This year, we decided to experience more of the festival by attending some of the author panels (the festival also got a a lot bigger in its second year and drew some really good authors). This panel was SO interesting. I really just wanted to see Holly Tucker because I’d heard such great things about Blood Work, but now I want to read all three of their books. This panel didn’t end up being much about Family Secrets but I LOVE Eleanor Brown and she is even better in person than she is on Twitter. 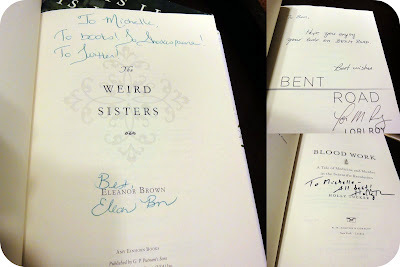 After the panel, I was able to meet her and have her sign my copy of The Weird Sisters (which you all should read because it is amazing). In case you can’t tell, Eleanor Brown signed my book “To Books! To Shakespeare! To Twitter!” which is pretty much the best inscription ever. You all should definitely follower her on twitter (@eleanorwrites). Because she’s awesome. I also got my copy of Blood Work signed and purchased a copy of Bent Road by Lori Roy after her panel. After the festival, we met up with a few other Florida bloggers for dinner and had a blast. Book bloggers are just so easy to get along with. As bloggers in Florida, I think we often feel a little more isolated than some other parts of the country so it was really nice to hang out with everyone and I hope we do it again soon. All in all, a VERY good, bookish day. Haha, I LOVE that inscription!! I was SO NICE to meet you. And have to agree, Eleanor is too much fun. Hey, could I use the picture of Doug, Deborah and me on my own blog? (With attribution?) Going to do a writeup of the festivities too. You can definitely use the picture. I’d be happy to send you the unedited version (without the rounded edges) if you’d like. Can’t wait to start your book! How jealous am I that you got to attend the blood and poison panel! I really want to read Blum’s book. It really was an amazing day, and getting the chance to meet Eleanor Brown was the thrill of a lifetime! I am so glad that you were able to come out, and I look forward to lots more Central Florida blogger get togethers! My post about the event should be going up Wednesday as well. I’m so glad we got to meet in person! I’m definitely going to make it to the UCF book fest next year. I met Eleanor on a bus during the weekend & she was great to talk to & so modest. THE WEIRD SISTERS sounds awesome. I attended my own panel & kept busy meeting readers, writers & literacy volunteers such as Natalie Rogers with BookPALS/PencilPALS. So I didn’t get to all the panels I would have liked. Many thanks for the informative post. Will look up the other bloggers. Hooray for local book blogger meet ups! Sounds like you had a fantastic time. Here’s to hoping the Florida community flourishes.